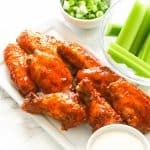 Buffalo Wings – perfectly crispy buffalo chicken wings tossed in a classic spicy sauce served with ranch dressing and celery for the ultimate game day and party snack favorite. And they’re baked! Game day isn’t a game day without all those snack food. It’s the only reason worth looking forward, at least for me, since I’m not the athletic type of person. AHA! And how could I not include America’s *ULTIMATE* game day and party favorite? Buffalo wings are seriously a massive hit here! They are best served on game day, party or simply when you get the hankering to nibble on some chicken wings. Why do they call it buffalo wings? 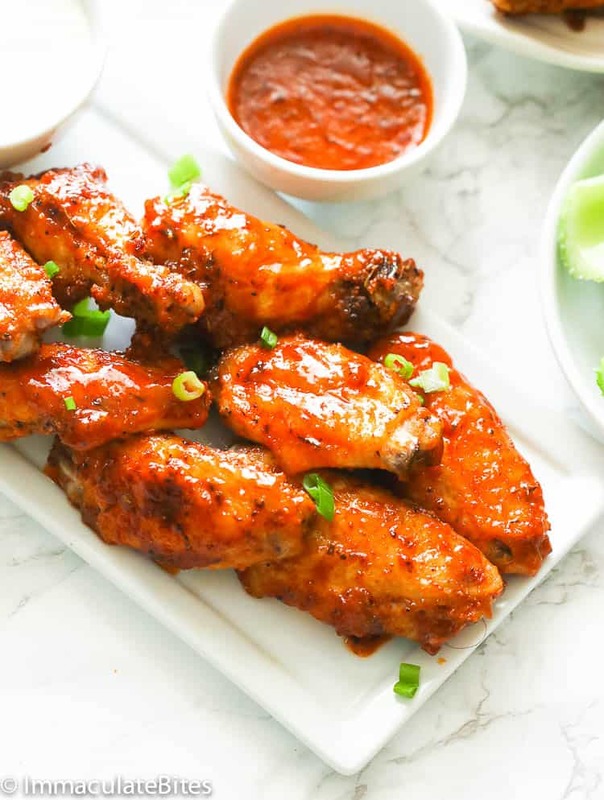 The first plate of buffalo wings was said to be first served in 1964 in a family-owned establishment in Buffalo, New York called the Anchor Bar. Teresa Bellisimo have first covered the first set of buffalo wings in her own special sauce and served it with celery and a blue cheese on the side since that were all she got at that time. The city of Buffalo has then celebrated Chicken Wing Day every July 29 since 1977. What is the difference between a chicken wing and a buffalo wing? Chicken wings used to be cooked only for making delicious chicken stock since they pack with tons of flavors. Thankfully, they were able to recognize how indulgent chicken wings could be. And now you got this buffalo wing. So what’s really the difference between chicken wings and buffalo wings? Chicken wings generally refer to the entire chicken wing part from joints up to the tip of the wings. Buffalo wings on the other hand is a portion of the chicken wings made up of smaller parts drumette piece and flat/wingette. See this PHOTO HERE for a clearer picture. While most buffalo wings served in bars and restaurants are deep-fried, these munchies here are BAKED. Yesss! Although I love anything fried (seriously..I do! <3 ), I got to resist it this time so I can cut back on the calories, at least a little, since food is just everywhere this coming holidays. But you can hardly tell the difference! These baked buffalo wings are as crispy as the fried version. How do I do that? Well, I use Alton Brown’s method of letting the wings dry in the fridge for about an hour or sometimes overnight which I used in this Baked Crispy Chicken Wings recipe. If you’re press with time, you can simply pat them dry with paper towels to absorb the moisture. How to make buffalo wings sauce? You only need 5 simple ingredients to make this out-of-this-world sauce. I use Frank’s original hot sauce for that classic spiciness and a tinge of sweetness, but if you can’t find one, any hot sauce will do just fine. Sriracha works, too – just add 1 teaspoon of sugar for a hint of sweetness. Simply combine all the sauce ingredients in a sauce pan and whisk together until thoroughly combined and bubbly. I also added a teaspoon of my homemade Creole seasoning for another layer of flavor. Just a little FYI though, if you reheat the wings after tossing them in the hot sauce, it softens but not too soggy. 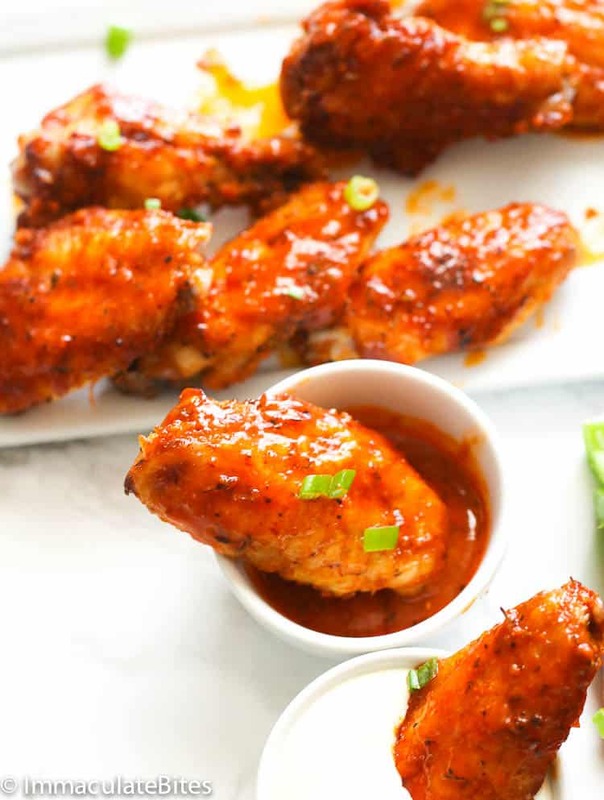 So in short, these baked buffalo wings are best served warm, around 10-15 minutes after they’re tossed in the hot sauce. These extra delicious, spicy and crispy buffalo wings are just in time for the holiday parties. 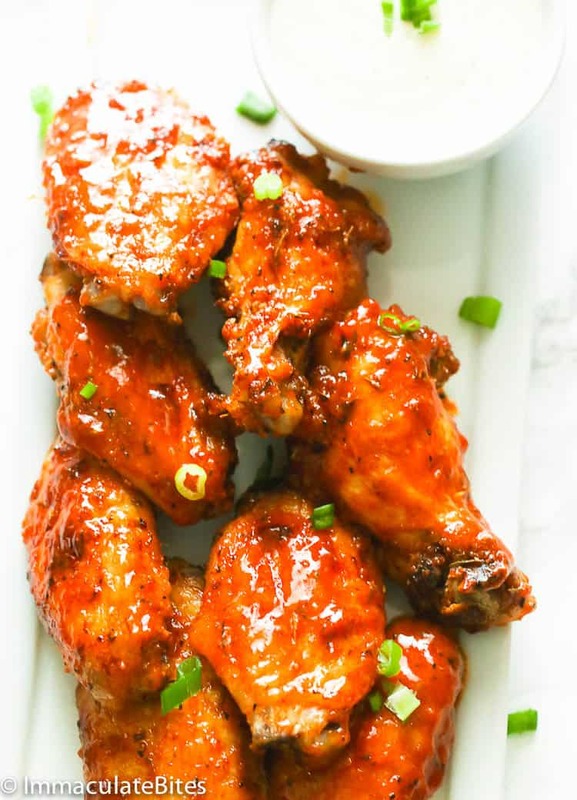 Just in case you want a variety of chicken wings to entertain your guests, you can also include this Caribbean Sweet & Sticky Hot Wings and Baked Jerk Chicken Wings in your list. Serve it with a blue cheese or ranch dressing for dipping. Tossing the wings in baking powder somehow draws moisture of the skin making it super crispy when baked. Or you can also let the wings dry in the fridge for about an hour or sometimes overnight if you’re prepping it ahead. Try not to move the chicken too much or open the oven while baking to conserve oven temperature. Flip them only once. Any hot sauce will do just fine. Sriracha works, too – just add 1 teaspoon of sugar for a hint of sweetness. If you want to keep it crispy as possible, only toss the wings into the sauce just right before serving. Pat dry Chicken wings and place them on a cookie sheet in a single layer , then let them sit in the fridge, until ready to use . For extra crispy skin let it sit for a minimum of 3 hours or preferable overnight. Do not cover them, let the air dry them out. When ready to bake , preheat oven to 425°. Place the chicken in a large bowl, with all the spices , then drizzle with vegetable oil. Line a baking pan with foil; top with a wire rack. Arrange chicken wings out in a single layer . While the chicken wings are baking oil will slowly drip to the bottom of the baking pan. Bake wings until cooked through and skin is crispy, about 45-50 minutes-rotate wings half way through-roughly 20 minutes. While the chicken wings are roasting, place small skillet on medium heat, then add butter, hot sauce, Creole seasoning , Worcestershire sauce and cayenne pepper. Stir for about 30 seconds until butter melts. Remove wings from the oven and thoroughly coat with sauce. Serve wings immediately with ranch or blue dressing, and celery sticks. 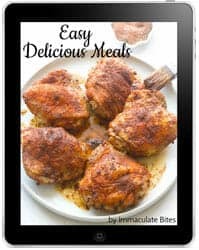 Pat dry Chicken wings and place them on a cookie sheet in a single layer, then let them sit in the fridge until ready to use For extra crispy skin, let it sit for a minimum of 3 hours or preferably overnight. Do not cover them, let the air dry them out. When ready to bake , preheat oven to 425°F. Place the chicken in a large bowl, with all the spices , then drizzle with vegetable oil. Line a baking pan with foil; top with a wire rack. Arrange chicken wings out in a single layer . While the chicken wings are baking oil will slowly drip to the bottom of the baking pan. Bake wings until cooked through and skin is crispy, about 45-50 minutes-rotate wings half way through- roughly 20 minutes. While the chicken wings are roasting, place small skillet on medium heat, then add butter, hot sauce, Creole seasoning , Worcestershire sauce and cayenne pepper. Stir for about 30 seconds until butter melts. Remove wings from the oven and thoroughly coat with sauce. 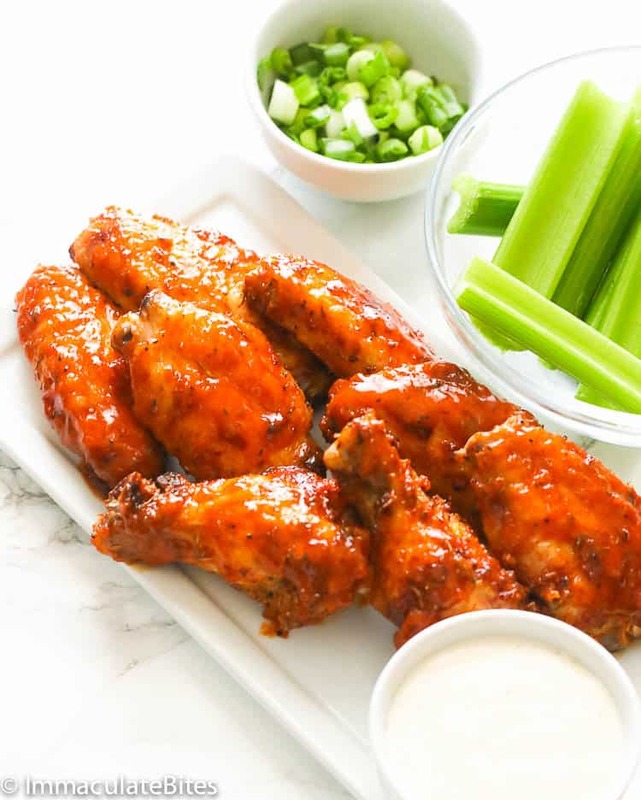 Serve wings immediately with ranch or blue dressing, and celery sticks. Great recipe. They were delicious. the sauce didn’t stick to my wings but i had to tweak it a bit, a little sriracha and honey replaced the hot sauce ( we are a mild flavor family). Also I didn’t let the wings air dry ( I don’t have the patience). Thank you for your recipe they were a big success definitely a new family favorite. I’m so happy, I made this today for my family and it came out GREAT! So easy to prepare, and I love how you place the wings on a rack over the foil pan. No mess, no grease spill. Merry Christmas Imma, I haven’t tried these wings yet, but I plan to next week. Looking for a “baked” appetizer to serve at our ladies bible study get-together. Thank you for all the great recipes you have shared with us this year. Keep em coming! God bless. God bless you too, Vergaline. And happy holidays! Hope you ladies enjoy this. Can’t wait to try the recipe! Do you make your own blue cheese dressing? Recipe please!! Don’t have one yet to post. Merry Christmas to you and yours. Wishing you all the best in 2019 !! !